Sun Noodle of Carlstadt, N.J., is recalling one lot of Tonkotsu Ramen. The flavor packet contains sardines, an allergen not declared on the label. 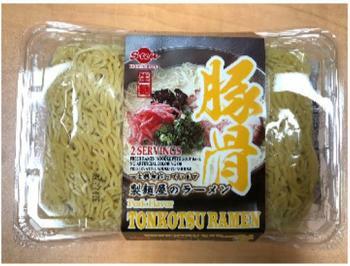 The recalled product, packaged in a clear plastic clamshell, banded with a Sun Noodle label reading "Tonkotsu Ramen" with lot code 3117332, contains two purple and white soup base packets, which show the name "Assari Shoyu" flavor. It was shipped to Asian food distributors in the New Jersey, Georgia, Illinois, Texas and New York areas, and then on to retail stores. Customers who purchased the recalled product should return to the place of purchase for a full refund. Consumers with questions may call 1-866-366-6353 toll free, Monday through Friday, 8:30 am – 5:30 pm (HST).